The first issue of Rob Reger’s “Emily and the Strangers” was a bizarre tale of a girl with a herd of cats who won a rock band contest. It had a ton of charm with fun made up swearing and nice “goth” art that anyone who was ever in a band could really get into. That same charm continues in issue two. In this issue Emily meets up with Evan at his house along with new two band mates: Willow and her brother Winston. While at the house, they try to get some practice in but to no avail. This continues when we meet Raven, a robot that is one of Emily’s inventions who decides to join up. Anyone who has ever had a band, or is in a band, will see themselves and their countless arguments in this comic. The band “leader” (Emily) trying to do her thing while everyone is trying to their thing. Not to mention how everyone in the band is awful and can’t work together. It’s a handbook for all bands everywhere that have had rocky starts or have broken up because they can’t get along. Throw in the “Hey, I found our newest member” angle and it’s pure musical bliss. Emily’s made up swearing and snarky personality are back in full force here. That is why Emily is such a great character. Words like “flabberfarking” and “zorking” should become the new alternative swearing. Even when Emily says that her band is like, “herding cats, only at least cats are useful. Sometimes.” You still can’t help but like her. Emily Ivie’s art rounds out the charm. This time though Ivie puts in more color to balance out the greys and blacks prevalent in the first part. These colors are there to show off the personalities of the new band members and it is nicely executed. Emily is still cute even though that might not have been the intent. 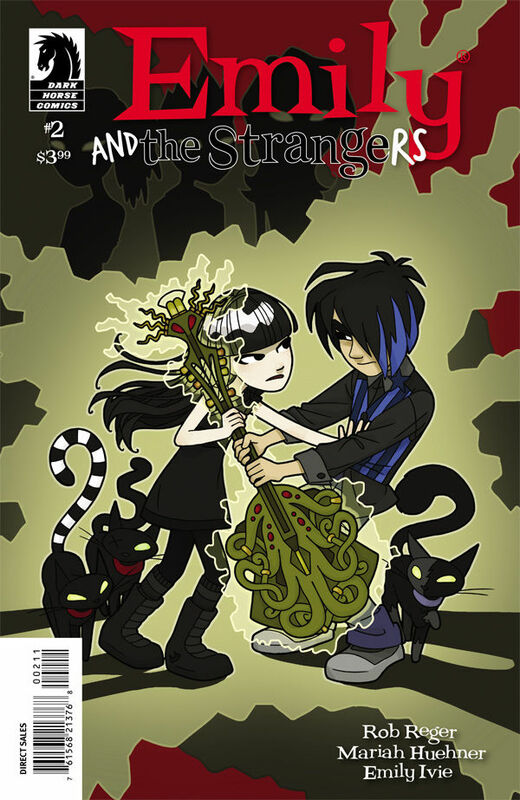 “Emily and the Strangers #2” continues with the excellent story and art that the part had, even with the lack of cats. Emily’s made up swearing and her band’s dysfunction will delight the musician in us all.